Specifies when the pitch bend will start in the overall bend window, based on the Bend: Length parameter or note duration. A setting of 0% means the pitch bend will start immediately. Increasing this value will delay the start of the pitch bend accordingly, e.g. 50% means that the note will initially play and hold its starting pitch for half of its duration before the pitch bend occurs. Switch 6 Bend Direction Controls the direction of the pitch-bend effect (bend up or bend down) as programmed by the Bend: Amount GE RTP. In respect of this RTC Model, it is most commonly programmed to -12 semitones for pitches bending down, and to value of 13 or "Next Note" for pitches bending up (i.e. 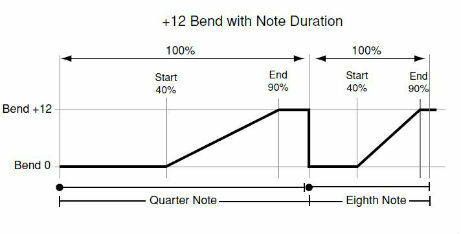 Bends each note to what will be the next note, creating a portamento-like effect). Note: the actual resulting size of the bend also depends on the setting of the Bend Range parameter, which sets the overall pitch-bend range for the GE. Furthermore, adjustments may be required to the timbre's pitch-bend settings in order for the bending effects to work properly. INT-C 072 TB Bang On !